Hi, Glenn! Could you briefly introduce yourself? Hi Nina! Yes. 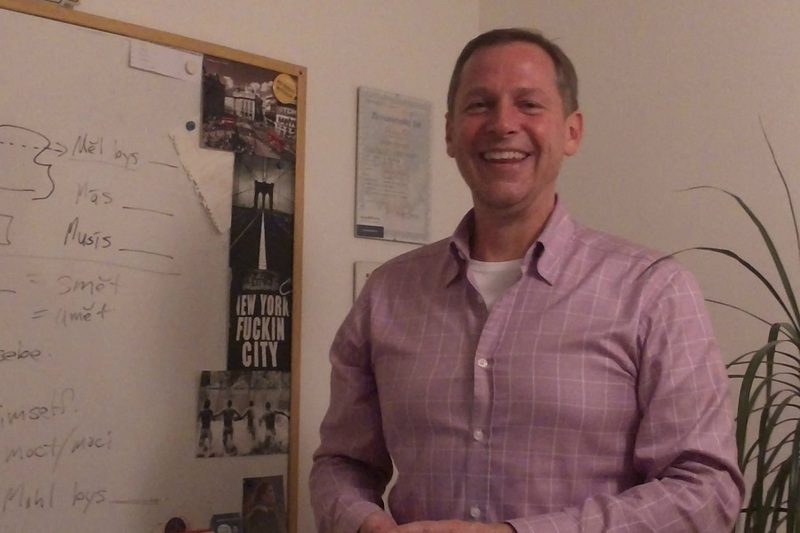 My name is Glenn Weidner, I am an American, I´m an English teacher in Třebíč – I live in the Czech Republic now – I´ve been living here for almost 5 years and…. that´s about it. It´s as brief as it gets. What made you come to Třebíč, Czech Republic? I came here 5 years ago when an American friend of mine, who was living in Moravské Budějovice with his wife, he called me and said: “Glenn, would you like to come to the Czech Republic and start a business with me?” So at the time, I don´t know what I was thinking, I said: “Why not?” and a few months later I moved here. So Třebíč…. Can you tell me a little bit about Třebíč? Třebíč is a… great town. It´s not small, it´s not big, it has about 40 thousand people and there are a few historical attractions here. Mostly the UNESCO places like the Jewish quarter and the basilica. But there are also some other things to see here. Ok. So you first started a business with your friend but gradually you became an English teacher. How did that happen? I just… One day – this was after my business partner returned to America – I wasn´t really sure what I was doing, where I wanted to go, and I received a phone call from a friend, a Czech friend, and he said: “Hey, Glenn, do you know anybody who would be interested in…. a native speaker who´d be interested in teaching English? And I thought: “I´m learning Czech… Can I do it?” And he said: “Yeah, yeah, you can do it.” So I got my business license a few weeks later and I started teaching English at the nuclear power plant in Dukovany. So how many students do you teach at the moment? At the moment… I´d have to look at my spreadsheet, I love spreadsheets, but I think I have…. every week I have 23 students that I see. Ok. So do people from a smaller town need to speak English? What is their motivation? Mostly people in smaller towns – and I would say even smaller than Třebíč – their motivations are… the main one – because of my students that I see – is for work. Whether they work for a German company, a Czech company, these companies see the future as having to deal with other businesses and the international business language is English. And then other motivations… lots of my students are mothers for example so this is a hobby for them. It´s something for them to do to get away, do something for themselves and improve themselves. And then, of course, there are things like, you know, students who want to… who´re in school, who need some extra tutoring. Or other people tell me, you know, they use it for travelling. That´s the only time they need English but it´s better for them for travelling. And what level are they usually on? Are they fluent or beginners? My students… most of my students have already had several years of English. Whether it was the normal public school system, or they took some language school after they finished their normal public school. So I would say most of my students have had about 8 years of English in some form… but they haven´t spoken so much when they come to me so… Maybe their grammar is pretty good and I think all of the English is somewhere in here, it´s just a matter practising conversation, normal conversation. So this is what I try to focus on. So you encourage them to speak as much as they can, yeah? By communicating with you and you also organize these free English meet-ups in Třebíč. Can you tell me a little bit more about that? Yeah, this is something I´ve been experimenting with and hopefully it will continue on a more regular basis… But once a month I´m putting together meetings here in Třebíč – we can go bowling, sit in a pub, it doesn´t matter. The more the merrier as long as we have space in the pub. So I will post an invitation on Facebook and whoever signs up can come, bring friends. And again the point of the meeting is to speak English. So anything… ask questions. And for me I guess the biggest reward that I´ve seen out of this so far – I´ve seen this a few times – is when I leave the table to go to the toilet, whatever, to pay the bill and I come back and – they still speak English – yes, I love that. It´s great. My final question for your would be: Could you tell us a little bit about some typical mistakes that Czech students make? I have my lists, I don´t know if every teacher has a list like mine, but what I focus on mostly with my students are basic things. So using and how to use the verbs “have” or “is” for example. I would say the biggest mistakes with “have” are things like – they typically are taught “have got”, they aren´t taught “have” and what they say when they come to me, they´ll say “I haven´t any money” or “I haven´t something to do” or “I have…”. You know, it just doesn´t right. So I´m trying to get them to use “have” and “have got” correctly. Modal verbs, I think, are very important. There aren´t so many of them so I think I focus on those a lot, especially the verb “must” where I would prefer that most people would use “have to”. And when they speak “must” is just really strong and we don´t use it as often as the grammar books might tell you. Ok, alright. Well, I´m hoping to make a few more videos with you where we can discuss more of these specific problems that Czech students have but for now I´d like to say good-bye. And maybe you could say something in Czech to finish the video. If you have any questions for Glenn, please, post them in the Comments!